We rotate our flavors so that there is always something new and fun keeping things exciting at LimeBerry. But there are some crowd favorites we try to have available whenever you visit LimeBerry. Our #1 flavor is cake batter! You'll find this on tap at all of our locations. The next most popular flavors are good ol' vanilla and chocolate. We also always like to have a no-sugar-added flavor available. Finally, you will usually find both a "tart" and a dairy-free sorbet for your enjoyment. 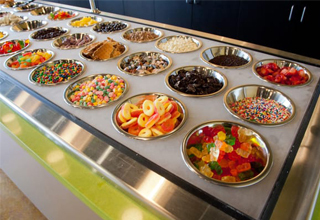 Mix in as many toppings as you like, choosing from over 50 that we have available at our exclusive topping bar. We have everything you could dream of, including granola, fresh fruits, all your favorite candies and cereals and more! At Limeberry, we believe that no taste should be overlooked. That’s why we’ve provided you with so many options. We feature 10 to 15 flavors in-store, every day. Stop in to your local LimeBerry shop today and see what flavors are waiting for you!